My pantry cabinet is a place of wonder. A cache of ingredients both practical and diverse, it contains just about every staple a baker could ever need, plus fun things like cans of pumpkin, bags of nuts, containers of cocoa powder, bricks of baking chocolate, and bottles of molasses and Lyle’s Golden Syrup. On the top shelf lives a canister of rolled oats so large it must lay on its side to fit. Sometimes, what I bake is determined by what lives in the pantry cabinet; I may open it one afternoon and realize I have a surplus of pecans, or some dark brown sugar that I’d like to use up. Today, after trolling online and finding a very simple yet delicious-sounding scone recipe, I was delighted to find that I had everything I needed right in the pantry cabinet, and that no trips to the market would be necessary. These scones are adapted from a brown sugar cinnamon scone recipe I found on another blog called Kitchen Treaty, which adapted its recipe from Alton Brown’s scone recipe. The result is heavenly, both in aroma while baking and in flavor while eating. 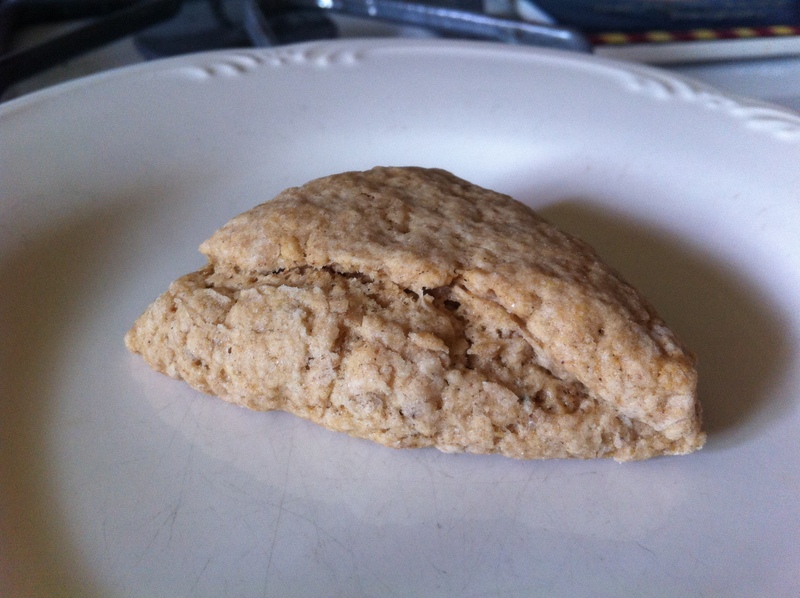 I chose to make small scones that are about two bites each, but you could certainly just cut them into 8 wedges like traditional scones if you prefer. In a large mixing bowl, stir together flour, brown sugar, cinnamon, nutmeg, and salt until well-blended. Add butter and rub into dry mixture until the mixture looks like coarse crumbs. Make a well in the center and add 3/4 cup heavy cream, vanilla extract, and egg; stir with a wooden spoon until a soft dough forms, adding the additional tablespoon of heavy cream once your dough has almost come together. Turn dough onto a lightly floured surface and knead gently to bring together. Shape dough into a circle and flatted to about 1-inch thickness. Slice into 8 wedges, then slice those wedges into smaller, more bite-sized wedges. You’ll have varying shapes; some will be longer and thinner while others will be more traditional wedge shapes. This is totally fine. Place on parchment-lined baking sheets and bake for 13-16 minutes; when done, scones will be firm on the top and just golden at the edges.